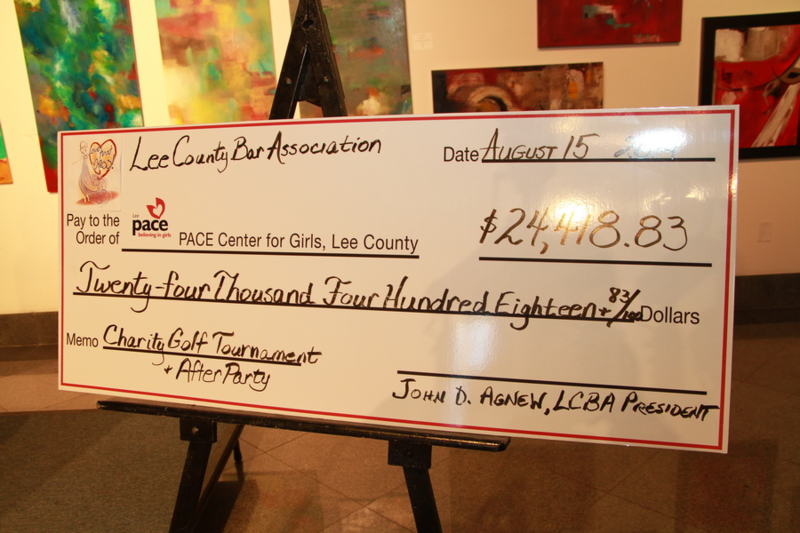 The Lee County Bar Association presented a donation of $24,418 to PACE Center for Girls of Lee County at its membership meeting on August 15. Sandy Stilwell, CEO of Stilwell Enterprises and Chair of PACE’s board, accepted the check on behalf of the organization from LCBA President John D. Agnew. Several PACE girls were also on hand, representing the organization’s many success stories, as were other PACE staff members. As a token of its gratitude, PACE has designated a room in its new school building at 3800 Evans Avenue in Fort Myers to be named after the LCBA. The funds will offset some of the remodeling costs incurred at the new building, as well as provide funds for the school’s operating expenses. The money was raised during the LCBA’s annual Charity Golf Tournament, for which Roetzel & Andress served as Title Sponsor, and an after party held in association with the Lee County Association of Women Lawyers. In addition to the monetary donations, the LCBA collected 257 dresses for PACE to sell at its annual Love that Dress! fundraiser, set to take place Aug. 27 at the Embassy Suites in Estero. An additional 100 items, including sh oes and accessories, were collected at the after party. The LCBA’s Fourth Anuual Charity Golf Tournament, which also included a lunch-time silent and live auction, raised more funds for charity than any other single event held in the LCBA’s 65-year history. PACE Center for Girls is a non-residential prevention and intervention program targeting the unique needs of girls, ages 12 to 18, facing challenges such as physical and sexual abuse, domestic violence, substance abuse, foster care, neglect, death of a parent, family history of incarceration and declining grades. The Lee County Bar Association, a 501(c)6 not-for-profit organization, has served the citizens and legal community of Lee County since 1949 and has a current membership of nearly 800. The purpose of the organization is to further the education of its members, create meaningful interaction among its members and inform the community on important legal matters. The LCBA supports the citizens of Lee County by providing free legal clinics on important topics of local interest; promoting the Rule of Law with student programs such as its annual Mock Trial competitions, and School Speakers for Constitution Week; and providing a Lawyer Referral Service to connect the public with qualified attorneys.For more information, call (239) 334-0047 or visit www.leebar.org.